Investigator: What kind of religion kills people? Michael: All of them, actually. Best described as a psychological thriller, The Apostate is one of the recent entries in the evolving "serial killer" fad making the rounds. 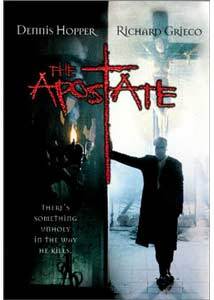 Like many similar films, The Apostate is bleak, dark, surreal, and uses a villainous character who has some kind of bizarre character flaw or quirk (other than the fact he kills people) that makes him 'different' from other serial killers. We've seen it before, and after watching this, it will seem very familiar, even if it's your first time with it. As the story opens, a mysterious serial killer (Dennis Hopper, not surprisingly) murders a gay prostitute in Puerto Rico. After the murder, we learn that the prostitute's brother, Michael (Richard Grieco) is a Jesuit priest and is taking the loss rather badly. He decides to return to Puerto Rico to console his mother. While there, he enlists the help of his uncle, a police investigator, to give special attention to the crime so they can stop the killer and avenge Michael's brother. As it turns out, though, Michael discovers he is able to ween information about the killer by viewing what's been done to the bodies. This leads the police on a twisted path through the underground culture of the area, and Michael's involvement in the investigation erodes what little is left of his faith and spirituality. In concept, the movie isn't too bad. It's got a nice theme of how a priest gradually loses what makes him a priest just to find the man. It's also very stylish and well-directed, with unusual, subliminal cuts and gorgeous photography. The acting is also very serviceable, with Richard Grieco turning in a fairly decent performance that goes way beyond his days as a 'teen dream' star. What makes all this curiously ineffective, though, is just how much The Apostate borrows from other movies to make its own world. To begin with, the killings are extremely brutal and have religious themes attached to them (which is where the title comes from, describing the killer). This brings up images of David Fincher's Seven, especially when the key to catching the offender is in the symbolism he himself used. Then we have the priest character, Michael, who is suddenly (and without explanation) able to extract fortunes of information about the criminal from looking at the crime scenes. The manner in which he does this is almost identical to the experiences of the central investigator in Michael Mann's Manhunter. Casting Dennis Hopper brings its own set of problems. He's done the psycho bit way too much, and when you see him here, he just reminds you of a slightly calmer version of his character from Blue Velvet. You don't see a possessed man who kills out of the urge to complete a vision, you just see Dennis Hopper being crazy, as usual. His performance is virtually phoned in, with him never really appearing in any meaty scenes; certainly nothing requiring a great deal of dialogue or effort. Another thing that damaged the credibility of the story for me was how the police just take everything Michael tells them as if it were completely true. It also gets some unintentional laughs that so much of Michael's 'forensic' skill is rooted in his knowledge of painting. By the end, I felt as if I was watching bits and pieces of other work being put together as a different film. In one final insult to the viewer, the ending credits roll downwards, just like the credits in Seven. It didn't sit well with me, and probably won't with most viewers. Dark, disturbing thrillers about serial killers are really starting to get old. It takes the right mixture of inspiration and handling to make these films work, and endless Silence Of The Lambs and Seven clones really won't accomplish much. The Apostate does try to do things a little differently by mixing in some subplot material here and there—ncluding some weird moments involving Michael's dark past in relation to his Monsignor—but none of it is resolved to satisfaction. There's also a neat, but predictable, bit of plot twisting towards the end. It's hard to accept a story about a priest losing his faith when he barely has any to begin with, but I suppose it serves to frame the 'darkness' of the story. As a moody thriller, it spins off in all sorts of directions and never really goes the distance with any of them. I admire what the cast and crew were trying to do, but in the end, you've seen it all before—and done with a more satisfying edge to it. Image Transfer Review: Although presented in full-frame, I have a sneaking suspicion the original aspect ratio was 1:85:1. I haven't found any proof, so it's just a theory, but there are some moments in the movie that seem like the sides are cut-off unintentionally, sometimes making the composition look funny. The image is generally acceptable, but nothing special. It looks alright for a full-frame transfer, but the elaborate photography and stark color schemes bring out some obvious compression artifacts. Very few scenes are actually stable, and there's always some shimmer in the background. It doesn't look much like film grain, but rather a problem with the digital master. What really damages the overal impression, though, is some rather heavy edge enhancement that brings out more artifacts and grain, and in some scenes, causes visible distortions and ringing. The film is watchable, but really won't remind you of DVD quality. Audio Transfer Review: Presented in Dolby Surround 2.0, the audio mix does its job pretty much without incident. I recalled no substantial use of the surrounds, and the majority of the audio is put in the center channel. The musical score and some ambient sound effects are done in stereo, but nothing special appears here. Nothing is distorted or hard to understand, though, and the clarity is good. The disc also features a Spanish audio mix in what is referred to as simply 'stereo.' This mix sounds basically like the English and I could discern no major differences. Extras Review: Other than some simple bios and filmographies, there are no substantial features. Unfortunately, the chapter stops are a bit inadequate, with a few chapters often running 10-12 minutes in length. You might want to rent The Apostate (I've seen it everywhere) as it certainly might entertain; it's just not very original or inspired. If you're bored with the 'better' films in the genre, this might be something interesting to check out.